Microsoft is soon going to launch its next generation Windows Phone 7.5 codename "Mango". Windows Phone 7 is due for a major update in the near future and Microsoft will integrate all its new features and updates in its upcoming Windows Phone 7.5 "Mango". According to the Microsoft new Windows Phone handsets are on the way this year from Acer, Fujitsu and Chinese mobile phone manufacturer ZTE. By adding additional OEM manufacturers to their existing partners, it is expected Microsoft will be able to reach a broader range of price points and attract a larger audience. 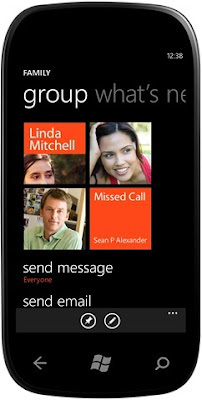 The devices will ship with the first really dramatic update to Windows Phone 7 'Mango'. In addition, Microsoft has confirmed new Windows Phone Mango devices will ship this year from all their existing Windows Phone 7 partners: HTC, Samsung, LG and Dell. We have already know about 30 confirmed and rumored major changes and updates present in Windows Phone 7 “Mango,”, so the other 470 changes must be either extremely minor or a load of other features that will be uncovered at tomorrow’s event. On that list we do have some big features, such as IE9 integration, multi-tasking, Office 365 support, revamped Xbox Live, Bing upgrades, Marketplace improvements and a boatload more. Microsoft showed off some of the new features of Windows Phone 7 Mango. The first feature showed off was the new tiles notification. The People tile has been extended to work with a variety of new social networks and media, Visual Voicemail will also be available in the live tile. You can now set up groups of people and communication features using groups. IE9 was announced at the event, and some interesting innovations that will come with it. The HTML5 speed test was run a variety of phones and platforms. On the speed reading test, Blackberry scored 4 fps, and WP7 was running at 26fps. Android maxed out at 10. This is accomplished by hardware acceleration in the phone and browser. New integration features for Bing were shown off that really make search results tie into features in the OS itself, instead of just delivering web links. The Mango update will be available to all WP7 phones, and will be a simple update on each phone, free of charge. Carriers will now be able to add a lot more customization to the phones they're releasing. Microsoft announced that that Mango will be the release that gets shipped on the first Nokia phone, and that Nokia phones running mango are already in the lab and working.